Triple P graduating class in February. L-R: Lauren Andreas, Michelle Brown, Esther Manriquez, Marianne Hepburn, and Tabiya Andrade. In front, Triple P facilitator Melissa Ruiz. Photo submitted by First 5 Inyo County. Inmates with children incarcerated in Inyo County Jail are being offered parenting classes. The kids don’t get involved until the parents are released, but the program is proving to be successful. 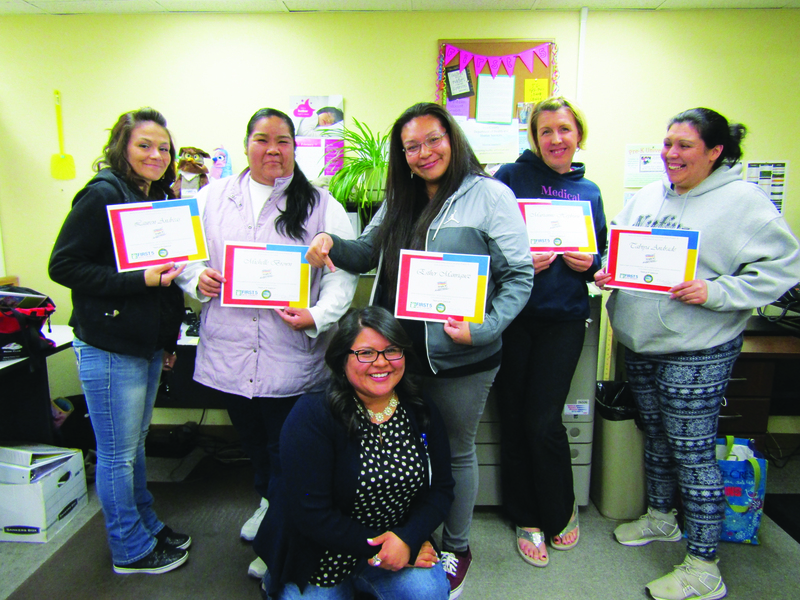 Serena Johnson, Inyo County First 5 Director and one of the facilitators for the Positive Parenting Program (known as Triple P), in jail, said a strong, healthy family and parent/child relationships have been proven to reduce recidivism. The class is also offered outside the jail. Johnson joins Melissa Ruiz and Barbara Keller, both Prevention Specialists, as facilitator. Triple P is a private corporation offering an evidence-based program backed by 30 years of research that is proven to strengthen child/parent relationships and prevent child abuse, Johnson said. Inyo County is into its third year with the program. There is flexibility to the state programs, Scott said, which are adaptable to fit local needs. Funding comes from California’s Public Safety Realignment and the Child Welfare Prevention Plan. In an effort to control overcrowding in the California prison system, Realignment is transferring non-violent felons from state prison to county jail. Jails are now holding inmates for multiple years—before Realignment, there was a maximum stay of one-year. The longer stays means there is enough time to offer extended classes, Scott said. Triple P is intended for parents with access to their children, so offering the classes in jail has created a challenge. A positive relationship between First 5 and the Inyo County Sheriff’s Office has facilitated the smooth implementation of the program, Scott added. Inmates do not have visitations with their kids, Johnson said, adding that small children have a difficult time processing the fact their parents are incarcerated. The program has two parts—eight classroom sessions are completed behind bars, with the final eight offered after the parent has been released. Seven parents have completed the program. There have been 24 total participants, on the inside and the outside, Johnson explained. She said many don’t officially complete the class and receive a certificate, but the parents do gain some knowledge from Triple P.
One man that committed to the program both in and out of jail now has a “high quality relationship” with his kids, Johnson added. The program is about strengthening relationships between children and parents, Johnson said, but in jail parents have to practice some of those skills with their fellow inmates. Incarcerated parents are asked to practice positive affirmations by telling themselves or cell mates they are good, caring people, or they’re happy to see them. Johnson called this practice “homework.” The sessions in jail consist of videos and discussions, but the key to success with the program is the homework, said Johnson. Parents practice responses to different situations then discuss what works and what doesn’t. They learn strategies to get out of the escalation trap, for example (where family members talk louder to get what they want and blow a situation out of proportion). By the end of the program, parents will have the confidence to apply these newfound skills without the need for a facilitator, said Johnson. Inmates are proud to have taken the classes, Johnson said, and gladly volunteered to have their picture taken for a Facebook post. “They wanted to show their friends and family,” Johnson said. The first success stories from the program, the local champions, are being recorded. The Fatherhood Initiative will be also be offered on the inside and outside this Fall. Johnson recently returned from a Triple P conference where she presented details of the County’s work in the jail, she said. For more information about times and dates for the Triple P, call First 5 Inyo County at 760.873.6453.